Cakes featuring military uniforms sold at one of the supermarket networks in Yerevan hint at the upcoming holiday –Army Day of Armenia. The 20th anniversary of the formation of Armenia’s Armed Forces is marked on January 28, and the jubilee celebrations this year will be held more pompously than in previous years. On January 28, 1992, the Government of Armenia made a historic decree on the “Ministry of Defense of Armenia”, which legally heralded the formation of the National Army of Armenia. In May 1992, the Ministry of Defense started the first recruitment throughout Armenia, establishing the tradition of staffing the army with conscripts. 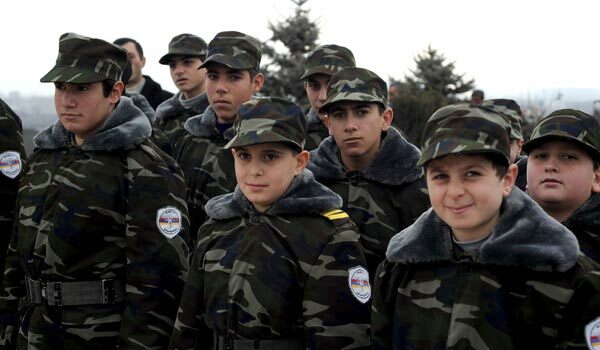 Before this, the irregular army fighting in Karabakh was made up of volunteers. Armenia started celebrating Army Day with greater solemnity since 2007, on the 15th anniversary of the formation of Armenia’s Armed Forces. A few songs about the army were written in that year and taught even at kindergartens, where children sometimes do their morning exercises listening to these songs. Friday evening a concert will be held in Karen Demirchyan Sports and Concert Complex. Saturday morning high ranking officers of the Armed Forces of the Ministry of Defense will visit ‘Yerablur’ Military Pantheon, which will be followed by a solemn session in the ministry, when state awards will be handed out. A fireworks display with 20 artillery salvos will take place at Republic Square in Yerevan, 10:00 p.m. on Saturday. A special liturgy will be served on the occasion of the day on Sunday in Mother See of Holy Echmiadzin. Prayers and words of gratitude will be delivered in chapels of military units and churches near military units.